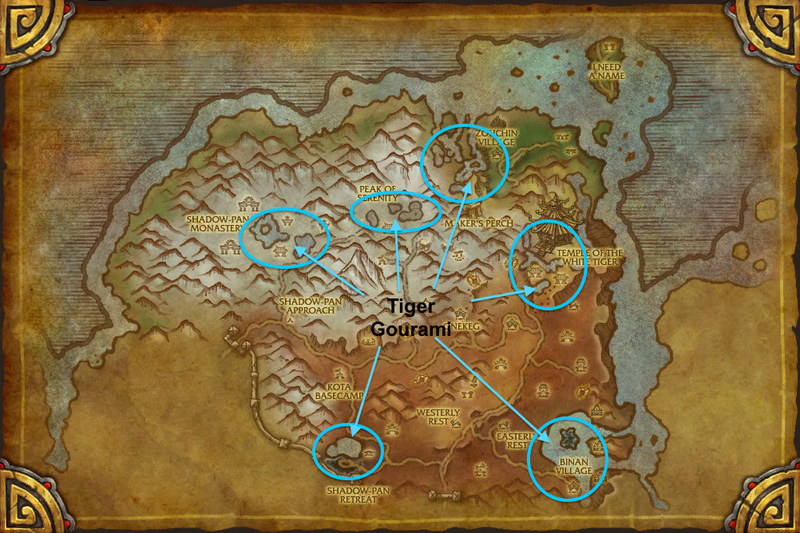 Our raid food tab is neatly laid out with the lines of ingredients needed for each dish that makes up the Pandaren Treasure Noodle Carts. The Veg is easy enough to come by, plant what you need etc, check with other people who is planting what so you don’t end up with thousands of Scallions and no Pink Turnips. The point is that for the veg all you have to do is go to Halfhill. The meat and fish require a bit more effort however as you do actually have to go to places. With this in mind heres a list of places to go to get your Redbellys or your Ribs. Head to Krasarang Wilds and check out the coast. In Townlong Steppes, Behind the Niuzao Temple in the lake. 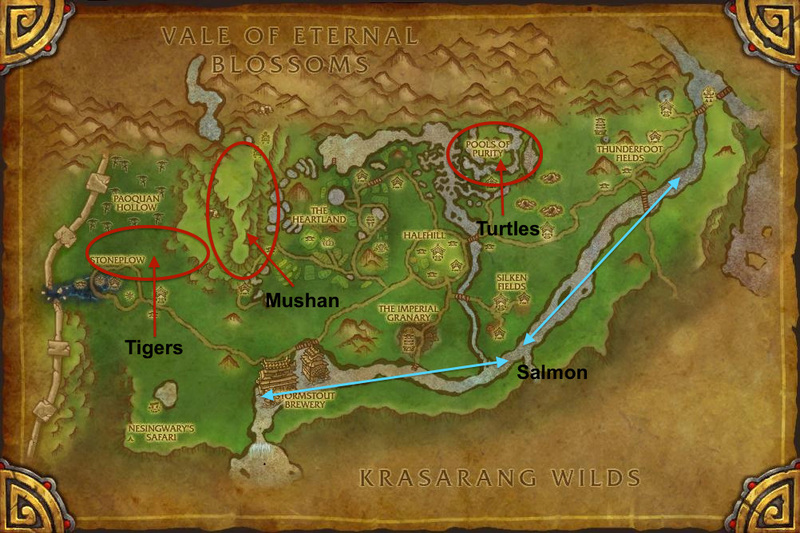 Don’t go looking in the Vale of Eternal Blossom as since the Sha outbreak, the fish got relocated. In the inland rivers and pools in Valley of the Four Winds. 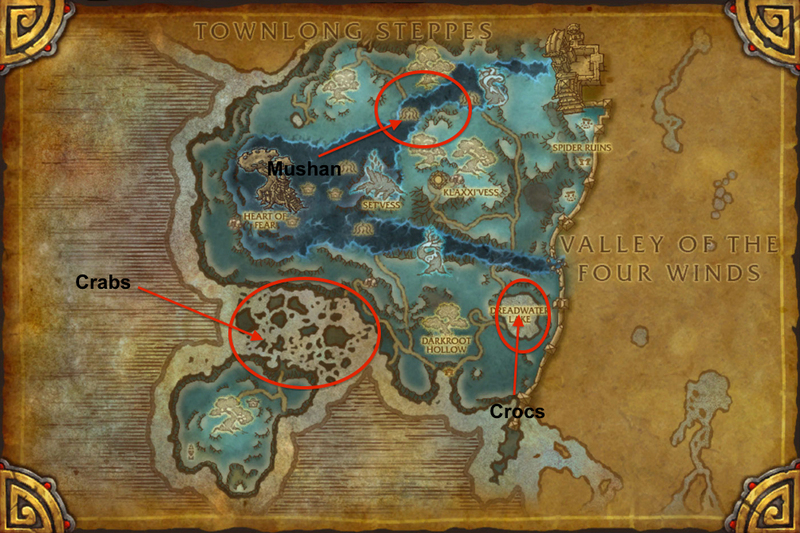 Unfortunately, you gotta head to the timeless isle. 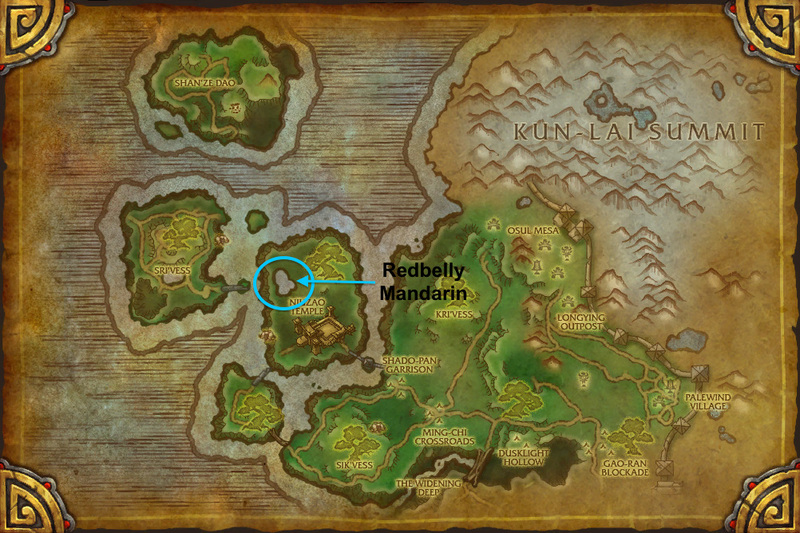 The lake behind where the Emperor is or up the hill to where the ruby lake is (with the rare) or the water where the graveyard is (where you spawn if you die fighting around near Ordos) Take a Albatross to get to the ruby lake, so much easier! Kun-Lai inland water. Around the temples are quite good for spots. Also the Ancient Passage to Kun-Lai is quite good for these. Got the option of the lvl 90 Frightened Mushan in the top centre of Dread Wastes or the more friendly lower level ones on the Skyrange in Valley of the Four Winds. Drop rate is higher in DW but they are harder to kill. I go to the wood next to the Tian Monastery for the Waxwood tigers. Spawn really quickly, easy to kill. 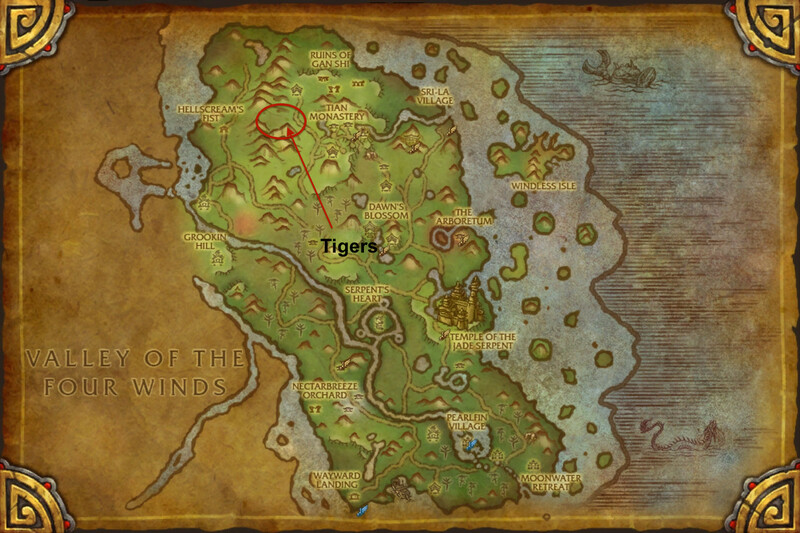 Although, if you are in the Skyrange killing the Mushans up there you could drop down to the valley next to it and get the green tigers in there rather than flying across. For this I got to the Dread Wastes and head to the Lake of Stars. You can do a lap around the outside of it and then if you get back to the start and they haven’t spawned, you can just go into the water and get the ones in there! Most comments point to going to the Briny Muck in Dread Wastes, however, I’ve found my favourite spot to be on the coast in Karsarang Wilds. 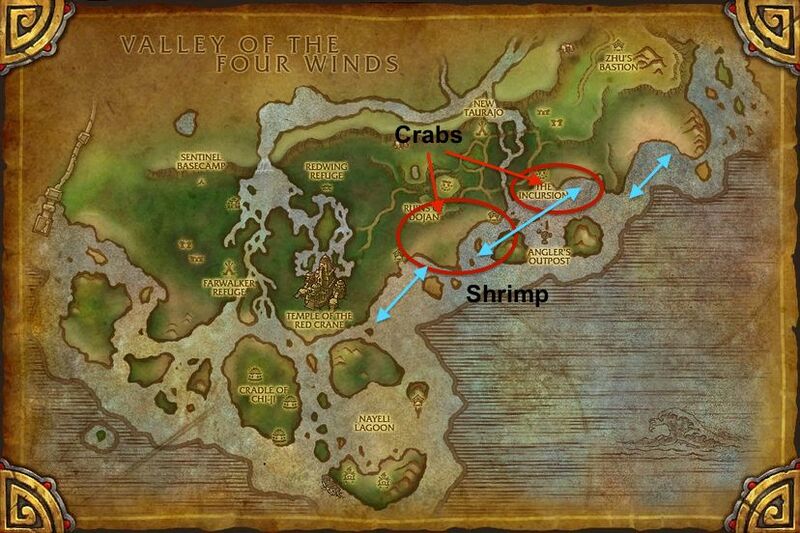 Purely because if I need to wait for them to respawn, I can go kill some invaders in the fishing village while im waiting and get some loot/cloth from them as well. My all time favourite spot for these is the Pools of Purity. Only because its a stones throw away from Halfhill and I’m lazy. 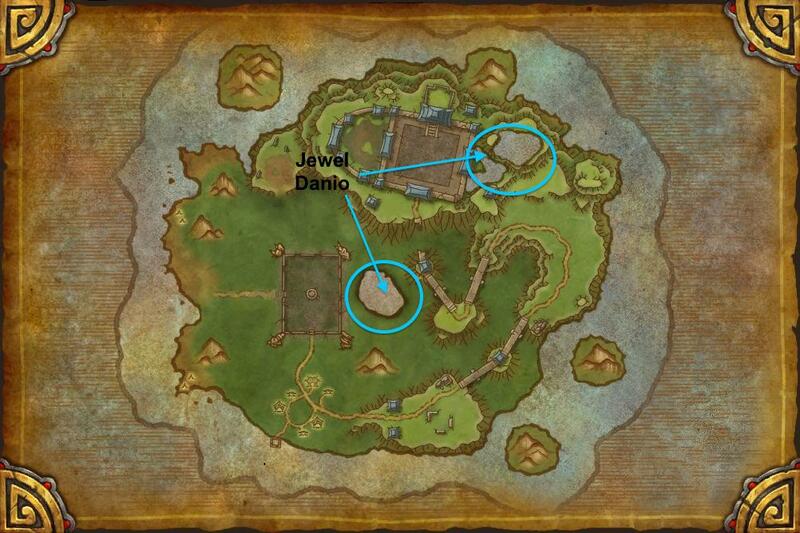 Or Alternatively, just check out the maps! SoO back to front and upside down.